I have a First Class BA (Hons) Degree in Graphic Design and Advertising. My training was diverse and enabled me to re-direct my practise towards my passion for form and pointedly, contrapposto - creating the illusion of past and future movement and the psychological disposition. I spent my final year specialising in fine art painting and drawing the human form. I have worked for the last 20 years as a freelancer in both London and Brighton. Whilst always working from my art studio, my own personal projects have had to exist in tandem with commercial commitments. These have been fairly diverse and have ranged from designing for drink brands including Jack Daniels, The Kraken, Red Bull and Bacardi to D&R within the music industry designing interactive games, websites and digital companion album concepts for artists including The Who, The Stone Roses and Kiss!! amongst other general album releases. 2. What are your sources of inspiration? I take inspiration from the Vienna Succession Movement - the idea of Gesamtkunstwerk. The idea that the piece of art is informed by and includes the gesture, strength and tension of classical sculpture to the weightless beauty of botanical illustration (as one example). It is a synthesis of the arts, an embodiment of many disciplines. 3. How would you describe your art? My artwork is concerned with the vocabulary of marks that show a fluidity and looseness of practise describing the human form. But with a powerful desire to show personality in the individual and the acceptance of received perceptions of imperfection elevating originality and uniqueness. 4. Can you tell me a little bit more about your creative process when you approached the current Life Study series which we have at the Naked Eye? I have concentrated the last year and a half to the discipline of life drawing. There are many great classes with an extremely talented community of both artists and models to draw from within Brighton. My work has been concerned with trying to find a visual language and colour palette that can exist in harmony with the subjects. My Drawings are usually A2 and scribbled in fast pencil line. I generally find that the short pose enables an immediate and spontaneous response. The LS Series are the first exhibited works from this body of preparatory study. 5. What is it about the human body that compels you to capture it in art form? One half - the subconscious tranquility of inner peace, and one half - the tension the conscious mind can impress onto physical appearance. 6. What do you hope viewers will take away from your artwork? 7. How has your art evolved? How do you see it evolving in the future? The intent for the LS Series is to evolve into textural multimedia paintings. The evolution of these works will show a multi-cultural persona drawing from all walks of life. We are a composite of our external influence and mindful free will to create and express ourselves. Click here to shop Alexander's art work. I've been experimenting over time. I used to try and under-paint by using the colour opposites of the final painting, so that elements of the contrasting colour zinged through in the final painting. However, for these paintings, I simply focus on a ground that is usually mid-tone but a prominent part of the final painting. I have a problem with traditional oil paint solvents; they give me really intense headaches, so now I use water-based oils that are healthy for the environment and me. The under colour of each painting is done either in gesso or in acrylics. I often mix up a specific colour rather than going straight from the tube, it enables me to get exactly the under-colour I want but does make it tricky if I ever need to retouch. Because of the nature of acrylic polymer emulsion, it's important not to dilute the ground paint; otherwise there could be later complications with adhesion to the canvas. As for references, I tend to work from photos, either my own or sometimes references provided by organisations such as WWF. Even then, it's not easy getting useful images of animals staring straight ahead, so I do a lot of work digitally, distorting/enhancing/colour balancing before I even start to work on the canvas. Once I have a reference I can use, I then transfer it, scaled up to the prepared canvas. I don't use charcoal or pencil, only a brush, and then sketch key positional elements, eyes, nose, mouth etc. I gradually build up in layers, using the traditional method of 'fat over lean'. Also, I usually start dark with the lightest tones and highlights last. 2. Where did your fascination with endangered species come from? Why are you so passionate about them? I’ve always loved animals. My wife and I live with three cats and three dogs; all rescues. Before my ‘endangered’ series of paintings, I used the same format on a series entitled ‘windows of the soul’. The emphasis was on the eyes. Initially, I had a gallery space to fill that included a long white wall. It occurred to me that if the paintings were all the same size and evenly spaced, staring out at the viewer, it might create an unnerving effect of the observer becoming the observed! After that, I started to think maybe the paintings could work a little harder. I was aware of the IUCN Red List and began to contact various conservation organisations. For example, if I sold an orangutan painting, then a proportion of the sale would go to Save the Orangutan. That way each painting would be working to save its depicted animal. To be honest, the evolution of my art is a natural process and as such is difficult to predict. It relies primarily on how my own life is unfolding, the situations I find myself in, the chance encounters that inform and shape my thinking and the way the world is changing. I think the way my art has evolved reflects this, some elements are discarded whilst other elements are carried through. There was a time I focused on large abstract colour field works. As a teenager I’d been particularly inspired by the raw emotional impact of Rothko’s work. My current work still relies on a relatively large format and a similar desire to create a powerful emotional exchange. 4. What is it about a certain animal that will compel you to paint it? Have you noticed that predators tend to have forward facing eyes, but non-predators have eyes of the side of the head? ‘Eyes in the front, the animal hunts, eyes on the side, the animal hides.’ All of my forward facing animals are therefore, predatory in the wild. If I want to paint a non-predator, then I have to adopt a different format, usually focusing on just one eye. I do regularly refer to the IUCN Red List to check on the status of various animals, with the most pressing potential subjects falling in the ‘critically endangered’ category. At the moment, I am working on a tiger painting because WWF are preparing a new initiative focusing on the plight of tigers so they need it to be ready for that. I try and steer away from paintings that are too ‘cutesy’ and therefore off message. Obviously, some animals are more endearing to the general public than others, so I have to think carefully about how they are presented. 5. What are your tips for aspiring artists? Without wishing to sound too clichéd ‘be true to yourself’. I think it’s OK, and inevitable to admire other artists’ work but we all have our own individual ways of seeing, formed by our unique life experiences, that should form the basis of our creative expression. It’s about having confidence in your own validity. I think we respond well to genuineness and sometimes that can be sacrificed if we are simply producing work that is fashionable. My advice for any aspiring artists who hope to make money from their work is to choose a different career! Most of the artists that have made any significant impact are those that have posed questions that buck the trend rather than just follow. Artists to my mind are communicators and therefore need to be clear about what they are trying to communicate and whether it is worth communicating. For me, exploration is a huge part of the journey and sometimes the biggest opportunities occur when things don’t go according to plan. Another tip is to become aware of how the brain ‘translates’ what you see and learn to depict what you actually see. In my work, observation is really important. Sometimes I even paint with the canvas upside down to help overcome this. 6. What is your favourite piece of artwork you have done and why? I tend not to have favourites. Or at least, I usually like the last piece was working on. If I didn’t then I’d start to question if I was learning anything new. A painting I was once pleased with, I might be fairly indifferent about now. I also, tend to like paintings that have had a difficult birth. It makes me feel they are here against all the odds. 7. Are you trying to convey a particular message to the viewer? With the ‘endangered’ series, I think that’s pretty obvious! It’s a call to action. ‘Hey, we need to conserve the biodiversity of our planet, or ultimately it will be curtains for all of us.’ Simply put, every eco-system is co-dependant and we are part of the mix, hence the fragility of our situation. It’s a very real and important message. What I’m painting is basically an animal death row. I’m aware of that and through my art I’m trying to raise awareness of what’s happening to our planet before it’s too late. 8. What do you hope viewers will take away from your artwork? I hope they remember it for all the right reasons. I hope it inspires positive action however small. If they get enjoyment from my work, then obviously that’s important too. Recently, I read Donna Tartt’s novel ‘The Goldfinch’ and there was a snippet that resonated with me … "And isn't the whole point of things -beautiful things -that they connect you to some larger beauty?" Clearly, in the widest context, there is a spiritual dimension to my work. It’s something to do with our sense of belonging in the world. That will become clear at the right time. I know that sounds trite, it’s not meant to. I do feel my art is a bit of an unfolding and that I’m not sure where it’s headed. For now, there’s a lot more work to be done in my current field. In December, I’ve been invited to Mauritius to teach and my subject matter, rather predictably, will be the dodo. It will pose a new challenge in that nobody really knows what they looked like. All that exist are somewhat contradictory eye-witness descriptions, illustrations and a few bones. All the ‘stuffed dodos’ are just later models. We don’t even know accurately what colour their feathers were. It’s going to take a fair amount of research to come up with a painting that feels realistic. Hopefully, the final piece will act as a red light not to have history repeat itself. 10. The eyes of your animals are extremely striking - what are you trying to tell us through these eyes? I guess the clue is in the title of my previous series of paintings ‘windows of the soul’. In a way, I want us to consider that animals are sentient beings too and should be respected as such. It’s amazing how much can be communicated through the eyes … pain, despair, happiness, fear, anger, hope … but always life. In my paintings, the depiction of the eyes is primarily a vehicle to help create a sense of ‘personality’ and ‘energy’ in the final result. Click here to shop Steve Nayar's original artwork. Between 30th September and 6th October, we will be hosting a joint photographic exhibition by Hannah O'Hara and Zachary Innes-Mulraine. We have a chat with Hannah to find out a little bit more about Expectations and Lessons in Forgiveness in this interview. 1. What is the meaning behind the title of your exhibition Expectations and Lessons in Forgiveness and why did you choose this title? I came up with this title while at university about 10 years ago. Back then, I was very 'wordy' and placed a huge emphasis on titles of projects and images. I wanted the audience to be very influenced by my own perception of the work and so didn't leave a great deal to interpretation. With this title, I felt that it was very evocative and quite beautiful, however, I didn't really understand what the title truly meant or how I could conceptualise the idea. It was therefore always a work in progress title to me until I could fully visualise and understand my intention. Throughout my 20's life changed dramatically and the parts of life that I felt were set in stone began to change and evolve into something different, sometimes good, sometimes bad and sometimes these changes were too difficult for me to cope with. More than anything, my relationships changed dramatically and this title became something I thought about in relation to my own experiences. I felt disappointed in the people I loved and found it hard to understand why people make the choices they do. This made me question my expectations in others and myself and the process of human psychology. I began to dissect the title, disappointment begins with an expectation of someone or something, to expect something and be let down or hurt by another begins a process of forgiveness and acceptance, and so the project began to form in a very organic way 10 years after the original thought. 2. How would you describe this exhibition? Quiet, contemplative and slightly eerie. These images as a collective represent an absence of someone or something. Each signal image is a personal representation of my relationships with others and there is a dance and communication taking place between the elements in each. It is also very much about renewal and rebirth and the reflective process we embark on once a change has taken place. This is why all of my frames are unique and assigned to a specific image. It's funny really as my work has always been very loud and brash, colourful and full of contrast with lots of drama. This is the first time I've exhibited work that doesn't really involve people but tries to explain relationships through objects and light. 3. What is your favourite piece in this exhibition and why? 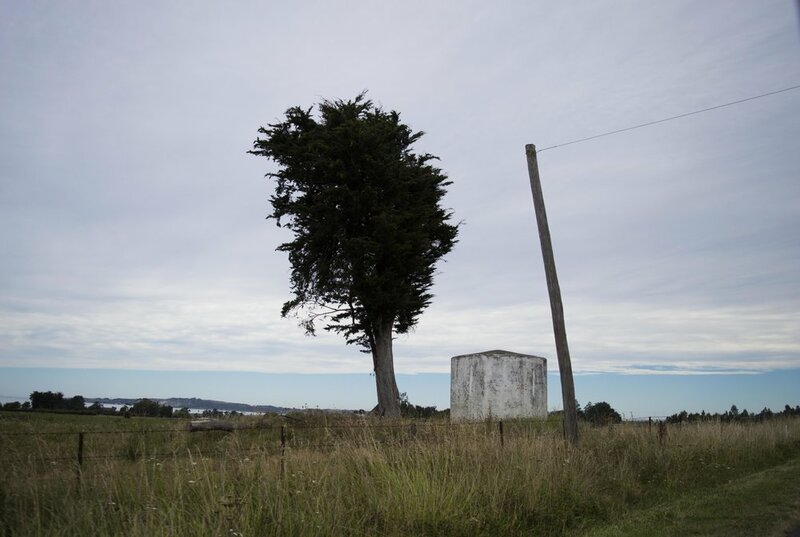 My favourite piece is 'The tree, the post and the water tank' as it imbues both harmony and conflict at the same time. In many ways, it's very calm and the three elements sit comfortably amidst a wide landscape. However, they are conflicting in their nature and the three objects comment on the complexity of relationships and the notion of a triad. Within my life, triads have been very prominent and without realising it I have ended up with 2 significant people in my life so this is a very symbolic image to me. 4. What do you hope people will take away from this exhibition? I always find this a very challenging question. When I'm working on documentary projects or photo essays I am very much thinking about communicating the idea to an audience. With this type of project however, my focus at the time is on my personal journey and to a degree it is a therapeutic process. I see this much more as a fine art piece of work and therefore I don't have any expectations of people's perception but of course hope that they can relate to the work and apply their own experiences to the images. 5. What are the processes you have been through in the last 5 years which has led you to having the Expectations and Lessons in Forgiveness exhibition? My work has evolved considerably over the last 5 years which I imagine is very natural when you move from your 20s to your 30s. Your ideas and motivations evolve and your general outlook on life changes which is reflected in the art that you make. The last 5 years have been about change, experimentation, acceptance and metamorphosis. As I mentioned above, I have dissected this title in relation to my own concepts of life and relationships and essentially have tried to understand life and its many twists and turns. In regards to practical processes, I have been very interested in doing everything and seeing a project as not just about the imagery but the entire life of the exhibition. I upcycle all of my frames and source them mainly from car boot sales or finding them in the street. I have become a lot less concerned with my own story and more concerned with the stories of others and of human interaction in general. 6. What does photography mean to you? Why do you choose photography as a medium to express yourself? I don't think you really choose your art form, I think it's an organic process that exists naturally. Some people paint, some dance, act, sing etc and I don't really think that there is much control over this. For example, you may hear a song and fall in love with it and listen to it all the time. It may drive your friend's crazy and they might think it's a naff song but for some reason everytime you hear it, it touches you in some way that makes you feel something you can't explain. From the moment I picked up Francesca Woodman's photographic compilation in the in the college library at the age of 16 I had that feeling. I was already studying photography A level at the time and had started taking pictures from the age of 14 as a way to distance myself from my experience. I've always been very observational and voyeuristic in my nature and as an only child, spent a lot of time watching the world and people around me. This is my first exhibition in 5 years and is very symbolic as the end of a chapter and the beginning of a new one. I am about to embark on my masters degree next year and am beginning to see photography in a different way. I will always be a fine art photographer at heart but want to begin to look at documentary photography and begin to tell other people's stories and comment on wider issues. 8. What is it about a particular scene or setting that will compel you to capture it? Predominately I focus on history and the notion of stories attached to places or objects. I have a bizarre fascination with public toilets as I see them as a mix between private and public space which fascinates me. More often than not, you'll find me in a low-lit carsy taking pictures of some anonymous and suspect stain on the wall :) I like derelict or forgotten spaces and lately industry and factories that are now disused and abandoned. I am drawn to things that tell the story of the lives that took place there. 9. What is your creative process in your composition work? I think as a photographer you are always trying to capture something in a new or different way. I examine a room or place when I enter it and look for stories within the space. What is there that is interesting, how can I frame something to communicate the atmosphere that I am experiencing within that space or how can I capture a moment and make it true to what is happening. 10. How do you see your photography evolving in the future? It's quite a strange process that takes place with your art form as you don't necessarily realise changes or evolution in your imagery. It is only by going through my portfolios and flyers previous exhibitions that I realise how much my work and technique have changed. As I mentioned before, I am more focused on documentary at the moment and want to return to my routes by working with medium format film again. I miss my film cameras so much and it's such a different experience developing and printing your own prints. 11. What is the message in this exhibition? I'm not sure that there's a definite message but more of a feeling and atmosphere that encapsulates the imagery. As the project is focused on reflection and understanding, it's kind of a coming of age story for me. It's more of a comment on experience than a message. 12. What is the role of the photographer in society? Ooh this is a tricky question, especially with the changes in technology and photography as a whole. At its heart I feel photography is there to document truthfully human experience in the time that it relates to. It should examine current situations and change within the larger context of society in order to bring awareness to a larger audience or educate future audiences. Whether this is editorial, documentary or fine art photography, whether intentional or not, it will always represent a facet of how we live, what we do and what our perceptions of the world around us are. 13. What are your tips for aspiring photographers? Don't try and be somebody else or compare yourself to others. This is true of all parts of life and it's almost impossible to do but you will always feel a sense of disappointment or inadequacy by placing an emphasis on others. When I was younger, I would instantly look at artists bios to see how old they were when they published their first book etc and would be left with a sinking feeling of not achieving the same things at the same age. Listen to your own voice and appreciate the things that make you different as an artist and remember that success comes in many forms and in many ways. It is your personal journey so enjoy it.